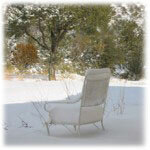 Ancient MetateArchaeological sites on the property provide evidence of early residents and their daily lives. 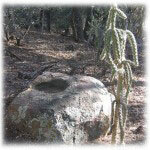 Ancient metates dating from 500 CE are an indelible indication that people of ancient times resided here. Historic rock-lined wellAn in-holding in the Burro Mountains portion of the Gila National Forest, Axle Canyon Preserve was created in late 2006. In the past it was part of a ranching operation as evidenced by the historic rock-lined well and corrals that are still intact on the property. 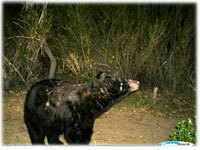 Black Bear on Motion Camera We are dedicated to restoring healthy riparian habitat and the natural flora and fauna of the area, including many birds and animals that can be seen at the Preserve. Our movement sensing cameras have captured a number of mammals including bears, coyotes, fox, coati and javelina coming to a water source provided for them on Axle Canyon Preserve. Recently two mountain lions have been observed on the camera as well as heard in mating ritual. 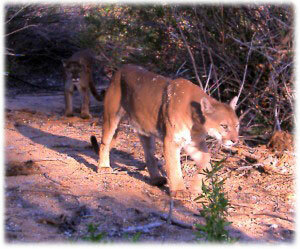 A series of pictures have been captured of both female and male mountain lions. A mother bobcat and cub have also been seen. The Burro Mountains feature lowlands, canyons, meadows, forests and semi-desert habitats that support particular ecosystems of plant and animal life. 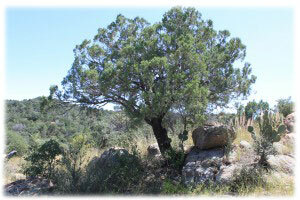 Rock Outcropping and JuniperPlant life includes cactus and juniper in semi-arid lowlands to Ponderosa Pine and Douglas Fir found in higher elevations. More than 200 bird species have been noted, including Red Tail Hawk, Golden Eagle, Screech Owl, Scott's Oriole, and Western Tanager within or close to Axle Canyon Preserve. We want to ensure that there are places away from the city to hike, camp, enjoy the outdoors as well as learn how to share the land with the deer, songbirds, bobcats, coati, bears, javelina, mountain lions and other wild things. Tea and ConversationWatch hummingbirds and enjoy the beautiful songs and vibrant colors of the Scott’s Oriole and the Western Tanager. Put out oranges, hummingbird food or seeds at one of our feeding stations during the spring and summer, then sit back, relax and watch the action. 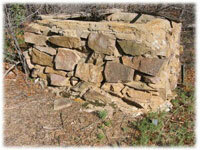 Take a walk through the canyon riparian area. You are welcome to request a private tour by appointment.